Hi, everyone! It’s been a while since my last post. This outfit always brings back fond memories especially the phuam. Hmong Sayaboury wear this distinctive headwrap. Below is an old photo of my cousins and I wearing the traditional head wrap. The process frustrated my mom and aunts. We were young and they wanted a nice picture but I think they quickly realized that it was going to be more difficult than they thought. By the time they fixed it on one of us, another one would already unravel. 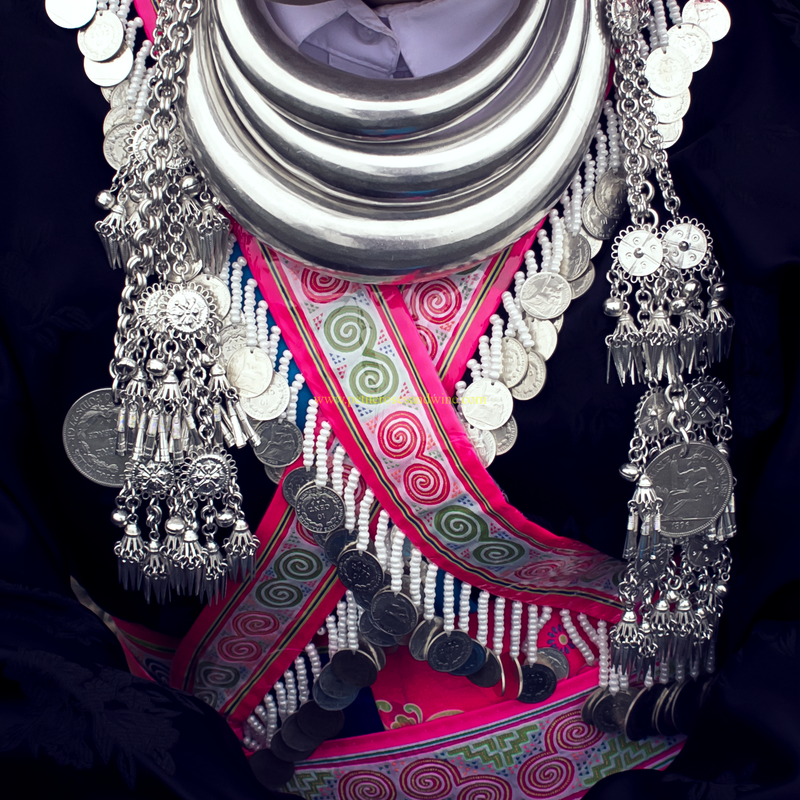 This post highlights the outfit that some White Hmong wear in Sayaboury province in Laos. The outfit is similar to the outfit that some White Hmong in Luang Prabang wear however the sleeves are longer and slimmer and they wear a different headwrap. Despite the difficulty in arranging it, I love the headwrap. Nowadays, the headwrap is made into a hat and not an actual wrap. I might post a video of how to wear it traditionally. The base of the hat is either purple or black fabric with colorful large yarn. Wrap siv ceeb on top to hold everything together. For decoration, place a little coin belt on top. Hmong Leng from this region also wear a similar headwrap paired with a different outfit. Above is a picture of the traditional head wrap. My maternal grandmother made this piece. I was told that when you are married you either wear one siv ceeb or none at all. This traditional xauv consist of 3 separate silver rings. When wearing pants, two aprons are worn with a shorter one in the back. Siv paj co, hlab nxtoo, and lastly tw siv with paj ntaub goes on top. I was always taught to wrap it so the paj ntaub peeks through. When the outfit is worn with a skirt only one apron is worn, the one in the back is omitted. In Laos, skirts were usually reserved for special occasions and for burial. Pants allowed the women to work in the fields and they didn’t have to worry about their skirts getting dirty. Thank you for reading! I need to be more consistent with updating. I have a couple of more outfits to showcase. Let me know in the comments if you want to see a Hmong Vietnamese outfit or a Miao outfit next. Where did you buy your xauv? It’s very pretty and different. This xauv I borrowed. They no longer make xauv like this and hard to find. You might be able to find them at silver shops and pawn shops. I’ve seen one ring xauv sold a couple of times but it would cost $1000+ since it has a higher percentage of silver.